Can cast bullets can be shot at jacketed velocities in my rifles with powder coating, and, if so, what are the upper limits, if any? What is the best method (for me)? Can hunting accuracy can be obtained at velocities of 2500 FPS or higher? Can match accuracy can be obtained at those velocities (at least at the Production level)? How do powder coated cast bullets behave upon impact at these velocities? Can powder coating take the place of a gas check? The purpose of this series was NOT to provide The Last Word in powder coating, but simply to describe in some detail the steps a rank beginner had taken to achieve passable results. I had no previous experience with powder coating. Some initial reading was done, but, being impatient and anxious to “get my hands dirty”, I jumped in with limited information, and made a lot of very valuable mistakes. Hopefully, those mistakes will aid others (see Part I). The most helpful advice came from a Fouling Shot article by Ric Bowman. Paraphrasing, he said that, when loading powder coated bullets, forget everything you know (think you know?) about loading cast bullets. That tidbit really kicked down the door. These things behave a LOT more like jacketed bullets than cast, but even that isn’t totally true. They are a law unto themselves. For me, slower powders worked better than faster powders—usually. A .308 case full of 4831 SC or IMR 4350 worked very well and achieved 2600 FPS (RCBS 165 sil) with decent accuracy. Most faster powders, including the usual suspects (4064, 3031, 4895, Varget) did not. Well, except VV N135, which did pretty darn well. Hmm. Ric Bowman’s advice to set the bullets a few thousandths from engraving was accurate for me as well. For one thing, this stuff makes them a bit hard to engrave. It’s not the same as naked cast bullets. Sizing to near jacketed specs, about .3085 (a nominal .309 Lee push through) was also best. This can be an issue, as some cast bullets can be a little “fat”, even in the nose. Add another 0.001” or so with coating, and, well, seating can take some effort. I found it prudent to push some bullets (especially 311284) part way into a Lee push through die, custom ordered at 0.301. With some fiddling, this not only sized the nose, but put a slight taper on the first driving band. Grinding the “wide spot” (I love technical jargon) off an aluminum nose punch of close fit (see photo) allowed the bullet to be driven out of the die using a ¼” punch and a plastic mallet. Once a routine is established this can be very quickly accomplished and with little or no marring of the nose. 1. Can cast bullets can be shot at jacketed velocities in my rifles with powder coating, and, if so, what are the upper limits, if any? Two rifles have resisted efforts to shoot cast bullets at full velocity. They were either wildly inaccurate and/or badly leaded the barrel. The usual fixes had been tried. They didn’t work. Powder coating did. There was no leading, and, in fact, very little detectable fouling of any kind. Depending upon the powder used, the third patch usually came out clean. Accuracy with selected powders was around 1.5” for ten shots at 100 yards with rare groups going to two inches. So, yes, they can. No velocity limit could be determined in the .308 Win, so rifles in 30-06 and .223 were tried. In the .223, velocities in excess of 3000 FPS were easily obtained with no fouling. Initial trials were less than satisfactory in terms of accuracy, but load development was minimal. This was merely to assess tolerance for velocity. I couldn’t find an upper limit, at least as far as any fouling was concerned. add ½ to ¾ teaspoon of paint and swirl gently until evenly coated. Clear coat paint worked best. 3. Can hunting accuracy can be obtained at velocities of 2500 FPS or higher? Absolutely. In the .308, consistent accuracy of 1.5 inches or so for ten shots is fairly easily attainable at velocities nearing and exceeding 2600 FPS with 165 gr. cast bullets. That should do it for about any reasonable hunting scenario short of very small varmints or very large beasts. 4. Can match accuracy can be obtained at those velocities (at least at the Production level)? First of all, this was not a good question. It should have been phrased more specifically, but at this point, I’m stuck with it. The answer is, not so far. I see no reason why this could not be done, but it will require further experimentation. For some reason, powder coated bullets appeared to be very finicky about details—much more like cast than jacketed bullets in this instance. Changing from a 185 gr. LBT that had been very accurate in these rifles, to RCBS 165 Silhouette had a huge impact. Groups were significantly smaller. Other instances of this fussiness were seen as well. (See comments below on alloy.) I suspect others more experienced in the process have achieved this goal. 5. How do powder coated cast bullets behave upon impact at these velocities? No idea and won’t have until Spring—maybe early summer. On 6 February, as I was getting around to this question, the walk to the 100 yard targets was through snow reaching to about the top of my 6” pacs. On 13 February, it was above my knees, at about mid-thigh. I’m 6-2. I will not be hand carrying newspaper and/or water jugs out there anytime soon. February snow fractured all previous North Idaho records for the month, with 56 inches in 19 days, and continuing in early March. I’ll submit an addendum when this information is available. 6. Does alloy matter? Wow. It sure does. Shooting in the .308 Win was begun with “hard” bullets. Linotype and oven hardened COWW + 2% tin. The latter tested out above 30 BHN. Hey, “everyone knows” that, at these velocities, hard bullets MUST be used. Groups were not. Groups that is. It was a pretty lucky thing if all ten landed on a 14”x18” target. Frustration was setting in. 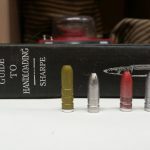 Enough so, in fact, to try loading some of the COWW bullets without hardening. Just ten. They went into 1.3 inches with all else the same (see target photo). The .223 was exactly the opposite. COWW bullets were shotgun patterns. Linotype, was, if not great (or maybe even good), at least in recognizable groups (2.5-3.0”). I’m not familiar enough with powder coat paint to know how much strength this stuff would add to a bullet, but it does appear to call into question the famous formula for determining alloy hardness in relation to pressure. Many of these loads were near the top (a couple frighteningly high, apparently—see part 1). 7. Can powder coating take the place of a gas check? No. Of 20 rounds fired from a Rem 700 using a Nightforce Benchrest 12×42-56 scope, 8 actually hit a CBA military target. On the plus side, there was no increase in fouling and no lead in the bore. Whoopee. What else has been learned? First a VERY high level of respect for powder coating was gained. There was no expectation that what is essentially a paint—no matter what type or how high tech–would hold up this well. Second, this is a very easy method of shooting cast bullets at full velocity. The process is quick and easy (after a little practice and, in my case, a lot of blind alleys), and excellent results can be attained, at least at hunting accuracy level. It takes a little more time than running through the ol’ Lyman 450–but not much more—and a lot less than paper patching. Would a switch to powder coating for all cast bullet shooting be recommended? No, although they’ve not been tried at more traditional velocities. The low recoil and noise of traditional cast bullet loads remained a huge plus. Those have always been accurate, effective and very pleasant. (Besides, I like the smell of bee’s wax.) That said, powder coating is definitely a tool in the drawer, and, in many circumstances (e.g. very windy areas), might be a very useful one. This higher velocity might make cast bullets more effective in hunting applications. Or less. Bullet behavior on impact is still unknown. From the bench with full loads, well, it’s not compatible with cervical arthritis, especially for the long haul. Sixty rounds tended to produce a mild head ache. There was no such problem with off hand firing. All in all, it was a great winter activity. It kept me out of the house (in the shop and on the range) and occupied, through what has turned out to be a VERY long winter season, and, hopefully, provided some useful information.